Tech support Dubai has substantial expertise in setting up and maintaining the Server Room Setup. We are ready and happy to assist your company in obtaining a reliable, secure and high tech server room. Our highly experienced experts will help in upgrading your current hardware or designing an entirely new server room. Tech support Dubai will offer you 24*7 services for server monitoring. The first phase of developing a server room includes planning. The professionals of Tech Support Dubai analyze the requirements of the customer and then produce an efficient IT technical solution, plan of implementation and detailed cost estimation. The technicians of Tech Support Dubai pay much attention towards providing hardware stability. This is essential for server room organization because this increases power demand and requires proper power distribution system. The server hardware must comply with high standards and satisfy requirements in data processing speed and capacity. Our experts keep all these factors in the mind while setting up a server room. For the implementation service, our experts will arrive at your office so that they can prepare a room for installation with some adjustment work. Our expert’s design server room individually on each order and deliver the result that matches the custom needs of our clients that too at best price. Tech support Dubai features highly qualified technical support for setting up and maintaining server rooms. What you need to do is to choose a plan that you think is the best for your business needs and receive a great technical assistance to keep your Server Room Setup and running. We are capable of setting a server room according to the technical need of our client. Installation of hardware and software in accordance with the produced plan. We also supply a full range of equipment for a server room. We provide support and maintenance for a server room. Tech Support Dubai has a good reputation for providing superior service and maintenance from last many years. We have dedicated team who understands very well the need of clients with respect to their business. We are committed to exceeding expectations in the areas of responsiveness, ease of purchasing, after sale service, etc. 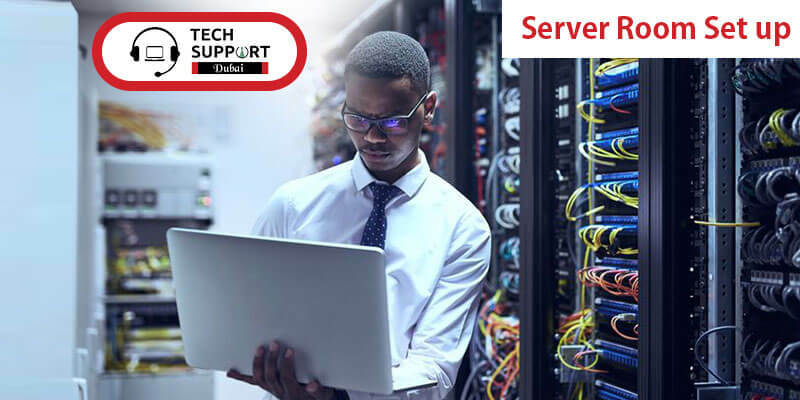 Contact the team of Tech support Dubai today and find out how we can help you design a new server room and clear all your queries. Reduces mean time to repair (MTTR) and human errors too. High-density capability and easy redundancy. Able to be scaled up or down, and reconfigured. Software to power, cool, monitors, manages and services your server room with ease and confidence. It is highly efficient, and the architecture can be deployed quickly, anytime, anywhere. Project management for the whole project: from assessment to project & ownership. How much is a server going to cost you? What will be the perfect size for a server according to your work and company? How is a network server going to work for you? How do you need to manage the server? We install the latest Microsoft updates and services on a regular basis. There is a reduction in downtime. Common problems are fixed automatically. Key applications remain consistently and speedily available. It is more efficient and reduces downtime helps the user to make the maximum use of their IT assets.